Check out our book fair signups on the "Events" page. It’s time to show our Woodland teachers and staff just how much we appreciate all of their hard work throughout the year. To do so, the PTA will be providing a luncheon on May 3rd for each school (Primary through Middle) and our administrative/transportation support. To help, we are asking families to donate a dessert (deliver items May 2nd afternoon or May 3rd before 9am). You may also make a small monetary donation (under $5) to put toward the event. Please send donations in an envelope marked "PTA Teacher Appreciation" to your school office before May 3, 2019. Do you have an incoming kindergarten student? Did you miss Kindergarten registration? If you have any questions, please call 847-596-5682 or 847-596-5683 en Espanol. Looking for some family fun? A place to get dinner? Look no further! Join us while supporting our schools. ​4 p.m. - 8 p.m. Mention "Woodland PTA" or show the flyers above when placing your order. Note: online orders will not be included in this fundraiser. 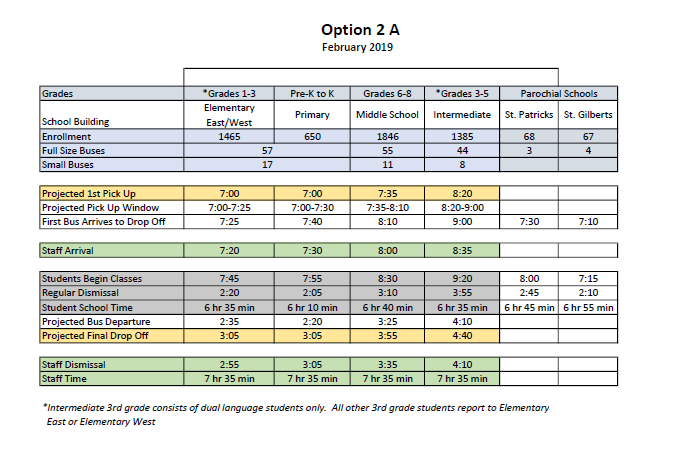 UPDATE: On February 28th, the Woodland School Board has voted to approve a change in start times for the 2019-2020 school year. Schedule 2A has been chosen. The vote was 5-0 with 2 abstentions. "Yes" votes from: Dr. Little, Mr. DeRosa, Ms. Hall, Mrs. Amen, Mrs. Haack. UPDATE: Start times and the community survey were discussed at the January 24th governing board meeting. The vote of school start times will be placed on the agenda as an action item for the February 28, 2019 governing board meeting. To view the community packet and/or start time presentation from the January 24th meeting, click HERE. UPDATE: At the December 20, 2018 governing board meeting, the board of education voted to delay the vote on school start times. The next scheduled governing board meeting will be January 24, 2019. The Board of Education discussed moving forward with changing student start times beginning in the fall of the 2019-2020 school year. In the district's Strategic Plan, Goal 4A includes an initiative to research new trends to aid in the advancement of programs that address the physical, mental, emotional and social needs of the "whole child." A vast body of research supports that Middle School students should start school no earlier than 8:30 a.m. for the betterment of the children's health. see our Facebook Feed below. ​Let's all work together to make our Woodland School District 50 schools even more great than they already are. Click HERE to find out how to become a member TODAY!